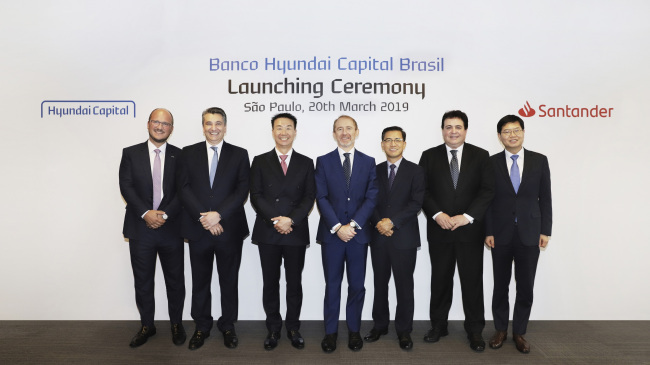 Hyundai Capital, the financing arm of South Korea’s Hyundai Motor Group, and Santander Brasil celebrated the launch of their joint venture, Banco Hyundai Capital Brasil S.A., in Sao Paulo on Wednesday, pledging tailored auto financing services for customers and dealers in Brazil. The joint venture marks Hyundai Capital’s first foray into the Latin American market and forms the first exclusive consumer financing service provider in Brazil for Hyundai Motor, the firm said. Banco Hyundai Capital Brasil S.A. is owned 50-50 by Hyundai Capital and Santander Brasil, a subsidiary of Spanish banking giant Santander Group. It was established with initial capital of 300 million Brazilian reals ($81 million) and approved for operations in February. Looking onward, Hyundai Capital expects to capitalize the growth potential of Brazil’s automotive market, where Hyundai Motor holds a 9 percent market share and the automotive financial service usage rate stands at around 48 percent. The auto financing firm is also ready to embrace the new business opportunities arising from Brazil’s soaring demand for new cars, which is expected to reach around 2.7 million vehicles this year, it said. “The newly launched joint venture will back the growth of Hyundai Motor with differentiated products and services and ultimately contribute to expanding the Group’s position in Central and South America,” Hwang Yoo-no, global president of Hyundai Capital, said. “As a bank, we will be able to reach the customers with more agility. We will be able to improve finance support for Hyundai, its dealers and final customers with dedicated products and services operating as a captive bank,” said Angel Santodomingo, vice president and CFO of Santander Brasil. Meanwhile, Hyundai Capital said the new JV would replace Hyundai Financiamentos, which previously formed partnerships with Hyundai Motor and Santander in Brazil. The customer relations established there will remain the same, but will be transferred gradually to Banco Hyundai Capital Brasil, the companies said.